Live the German Life and Study German in Germany! What are the advantages of studying a foreign language in a country where it’s spoken every day? The key is that you don’t just study it, you also get to practice it in real-life situations. You gain an insight into a different culture and experience a new lifestyle. Germany is considered one of the most attractive countries for international students. Its excellent education system and its vast cultural variety make it a great choice for all kinds of students. However, going all the way to Germany to study can be a huge step out of your comfort zone, especially if you don’t speak much German. Fortunately, there’s a remedy for that: learn German in Germany! From cosmopolitan cities to traditional college towns, there are plenty of great places to learn German, for language students and university exchange students alike. Read below to see why you should still take the plunge, what to expect and how to make the most of your time abroad. This post will provide useful information for those interested in taking part in a language course or university exchange program in Germany, as well as for everyone with a genuine interest in German lifestyle and culture. What Does a Typical Student Day in Germany Look Like? Generally, everyday life in Germany is very organized. And so is studying there. Let’s start by looking at a typical day in a language school or an academy dedicated to teaching German and other languages. When you start a language course, or even before you do, you’ll be given a Stundenplan (schedule). Most classes run Mondays to Fridays, from 9 a.m. until around 2 p.m., varying from school to school and depending on the program you choose. You’re expected to show up on time. Yes, Pünktlichkeit (punctuality) is a big part of German etiquette and it’s rude to show up even 5 minutes late. “Mein Bus war verspätet” (“My bus was late”) is not a good excuse, as German public transportation is generally very reliable. Your language school classes will be split up into general language classes, grammar classes, German conversation classes and special interest classes. Usually schools have weekly tests to make sure their students stay on track. Many schools include afternoon activity programs in their curricula. These include visits to tourist attractions, outdoor sports and social gatherings. During these activities, you can apply your new vocabulary to real-life situations and extend your knowledge of German culture. It’s very common to meet up with your classmates after school to do your homework together and prepare for the next class. Even better would be to find a Tandem Partner, a native speaker who assists you on your way to German fluency. You, in exchange, help them to boost their knowledge of your mother tongue. Conversation exchange partners can easily be found using websites such as SprachDuo. If you’re enrolled at a German university, your daily routine might differ slightly from the one of a language student. Universities go against the stereotype of German strictness with their flexible schedules and the absence of attendance checks. University students enjoy a lot of freedom, which is great when it comes to reconciling your student life with your private interests. However, a lot of self-discipline is required, otherwise you might spend some long nights in the library before your exams. First of all, you have to decide which city to go to and choose the right program for you. German courses are offered at many different locations by renowned language schools such as the Goethe Institut, Berlitz and Humboldt. They cater to all levels, from beginner to advanced, and offer specialty courses such as Business German. Even if you go to a smaller city or town, it’s likely within traveling distance of a city with some kind of language school. So if you’re set on a particular location, search for language schools nearby. If you’re interested in spending a semester at a German university, you should check out the website of the DAAD (German Academic Exchange Service). You should also talk to your home university’s international office; they might already have an exchange agreement with a German university. Classroom learning is essential for becoming fluent in a foreign language. However, practicing your German skills in everyday life is just as important. Living abroad can teach you a lot about a country’s culture. You can meet new people and experience their way of life. However, in order to get really good insight into German routines, you have to mix with the locals. Don’t be shy! Germans may seem a little cold and distant at the first encounter, but once you get to know them better, they can be an incredibly fun-loving bunch. Move into a Wohngemeinschaft (shared house). Many young Germans choose to live in a Wohngemeinschaft, or WG for short. Living with others not only allows you to save money but is also a great opportunity to meet new people. It’s very common for Germans to move in with people that they haven’t met before, so don’t be scared of sharing your house with strangers. Join a Sportsverein (sport club) or another kind of club. Much more than being just a place to practice your favorite sport, sport clubs are all about having fun and being social. Not into sports? Well, why don’t you join the Musikverein (music club), the Kulturverein (culture club) or the Naturfreunde Verein (nature lovers club) instead? Find a Nebenjob (part-time job). If your language skills have reached advanced status and you’re legally allowed to work in Germany, you should look for a Nebenjob (part-time work). You can earn some extra cash, get some work experience and connect with your colleagues. Popular jobs for young people are bartending, promotion work, event catering and babysitting. Another option would be to combine your studies with a Praktikum (internship), possibly in a field that you’re planning to specialize in later in your career. Volunteer for social causes. You might not be able to pronounce the German word for voluntary social work, “Freiwilliges Sozialengagement,” but you can still do it! Germany is known for its innovative social projects, and being part of one can be a very fulfilling experience. Projects range from working with disadvantaged kids in schools to assisting refugees with their integration into the German community. You can help out a couple of hours a week or volunteer full-time after finishing your studies. Date a German. Dating a native speaker is a great way to improve your German skills and to deepen your knowledge of the local culture. Thanks to dating apps it’s easier than ever to make connections on the go. The most popular ones in Germany are Tinder, Lovoo and Parship. Before you go looking for your first date, though, make sure you have some German pick-up lines ready! Who knows, maybe you can impress your date with your German flirting skills. You wouldn’t be the first one meeting die Liebe Ihres Lebens (the love of your life) while studying abroad! Feeling Like a Local Yet? 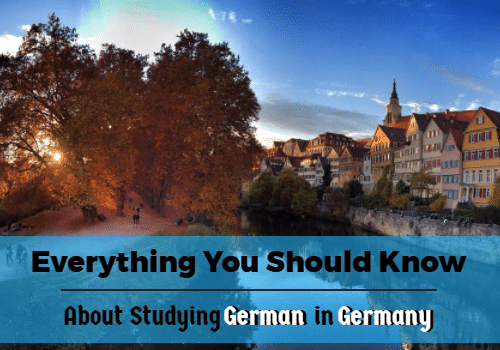 Once you’ve overcome the initial culture shock and gotten into your student life routine, you’ll find that Germany is actually quite an uncomplicated country to live in. You’ll see that studying in a place where everything is orderly doesn’t mean that fun and social life have fallen by the wayside. You’ll start to see a foreign language as a means of communication and a key to a new culture, rather than a set of grammar rules and vocabulary lists in a dusty old textbook. Of course, sometimes the journey of learning a new language and adapting to a new country may feel like a never-ending road. Sometimes it can be challenging to stay optimistic and motivated. But keep going! After all, you’ll realize that going out of your comfort zone will give you an entirely new perspective on the world, broaden your horizons and deepen your cultural understanding. It’s an experience no one can ever take away from you!